It is only natural for you to want to save money on your online spending. However, Coupon Marvel is not the application to help you with that. It is true that this program promotes itself as a useful tool that can provide you with relevant information on the best deals and discount offers, but you have to remember that you cannot trust adware applications. You should remove Coupon Marvel from your computer the moment you notice it on your browser. Although adware programs are more about monetary profits, they might also be involved in malware distribution. To be honest, Coupon Marvel is an extremely intrusive adware application. The funny thing is that it claims the opposite at its official website. You can check it out at coupon-marvel.com. Contrary to a big number of other adware applications, Coupon Marvel does have a direct download link at the website. However, it is very unlikely that users download this program at the main homepage–it is hard to come across the website unless you actually look for it. Hence, we can assume that the main method of Coupon Marvel’s distribution is bundled download. That means that Coupon Marvel arrives at your system together with other potentially unwanted applications. Users often do not realize they download unwanted programs when they install some freeware app from a third-party file-sharing website. If you are not attentive enough, you will miss installation steps that inform you about third-party applications that enter system as additional features. Coupon Marvel will definitely be one of those programs, and once it gets installed on your computer, it will add extensions to your default browsers. The next thing you know, it will start collecting information on what websites you visit. Data on your web browsing habits is necessary so that Coupon Marvel can generate a flow of tailored advertisements. Adware programs need to display customized content because it increases the possibility of users' clicking those ads. However, you should never click Coupon Marvel ads, because you might be redirected to unfamiliar third-party websites. Applications like Coupon Marvel do not review the third-party content that gets embedded into their ads. That means that if cybercriminals want to make use of this application to promote their content, they will do so. You need to avoid such risks by removing Coupon Marvel from the PC right now. Uninstall Coupon Marvel via Control Panel and then disable the extensions on your browser, because manual removal does not terminate all the adware files. You have to be sure that all unwanted files have been removed from the system, and the best way to do that is to acquire a powerful computer security tool and run a full system scan with it. Do all you can to protect your system from harm. Open Uninstall a program and remove Coupon Marvel. Go to Uninstall a program and remove Coupon Marvel. Select Add or remove programs and uninstall Coupon Marvel. 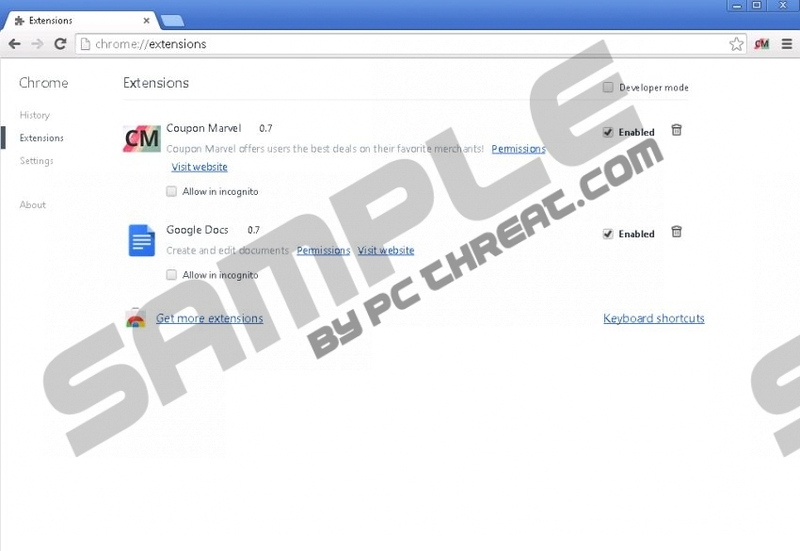 Disable Coupon Marvel on Toolbars and Extensions. Disable Coupon Marvel on Extensions. Open Extensions and disable Coupon Marvel. Quick & tested solution for Coupon Marvel removal.